A former aide to Alex Salmond has launched a bid to succeed her old boss in his north-east seat at Holyrood, it can be revealed. Jennifer Dempsie, a senior figure behind-the-scenes in the SNP and the independence movement, told the Press and Journal she would seek to be the party’s candidate in Aberdeenshire East next year. The 33-year-old said last night that it was a “great honour” to have been encouraged by colleagues to throw her hat in the ring for nomination, but that it would be a “tough act to follow” for whoever gets the chance. Mr Salmond will stand down as Aberdeenshire East MSP next year following his election as the MP for Gordon in May. Ms Dempsie, who lives in Garmouth in the north-east, began working for the SNP a decade ago as a press officer for Nicola Sturgeon, before being appointed as a special advisor to Mr Salmond when he was first minister. She helped run several election campaigns, was public relations manager for the pro-independence Yes campaign in the run-up to last year’s referendum, and is a former associate director at global communications agency Weber Shandwick. 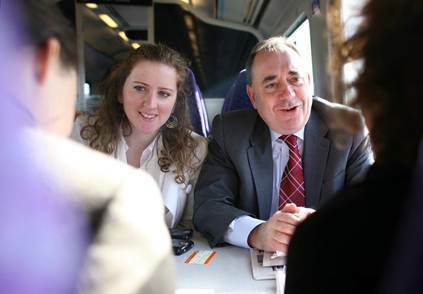 She added: “Alex Salmond will be greatly missed in the Scottish Parliament. “He has served his constituents with passion and diligence both as their MSP and as first minister, which he is of course continuing for them at Westminster. The Aberdeenshire East constituency was created at the 2011 Scottish elections. The predecessor seat, Gordon, was held by the Liberal Democrats until Mr Salmond’s victory in 2007.